Road Angel Professional Connected uses mobile phone GPRS/GSM technology to automatically and wirelessly download updates to speed camera locations as you drive - there is never any need to plug it into a PC! 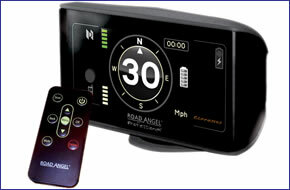 Road Angel Professional Connected also features remote control operation and a built-in rechargeable battery, which provides up to 8 hours wireless operation. The Road Angel Professional Connected speed camera database warns to blackspots, schools, fixed speed cameras and mobile cameras with visual, spoken and audible alerts. Road Angel Professional Connected has been discontinued. Accessories are still available for your Road Angel Professional Connected click here. Road Angel Professional Connected GPS speed camera detector provides visual, spoken and audible alerts to speed camera and blackspot locations across the UK. The Professional Connected features a 2.4-inch TFT LCD full colour screen which you can customise to your taste, in addition the sleek design with remote control operation means no more stretching across the dashboard. Road Angel Professional Connected also features an in-built rechargeable battery, providing wireless operation for up to 8 hours and the automatic power function means you never need to remember to switch on or off. Road Angel UK wide speed camera locations are updated via GSM/GPRS technology every few seconds. The Road Angel Connected uses a built in SIM and the mobile phone network to download updates as you drive! No wires, no computers - no hassle! In addition the Road Angel Connected also feature in-built tracking function enables your location to be identified in an emergency by friends, family or the rescue services. The Road Angel Professional Connected includes one months free trial of tracking function, additional subscription required for ongoing use. Professional Connected alerts the user to: fixed safety cameras, mobile safety camera locations, SPECS speed accident blackspot alerts, school zones, congestion zones and Railway crossings. The Professional Connected model is capable of storing up to 50,000 unique speed cameras and identified accident blackpot sites. Updated and verified continuously by Blackspot Interactive, the central database can also be easily personalised. Clearly the most advanced unit here with its rechargeable battery and fantastic, easy-to-read screen. Trap and limit warnings were provided verbally and displayed clearly, and the Road Angel didn’t put a foot wrong in seeking out cameras. Set-up was by a remote and, using its on-board GSM phone, it updated automatically. Predictably, though, all this technology comes with the highest price - which holds it back. The Road Angel Professional Connected is easy to install using the provided suction cup and operates independently using power from its internal lithium-ion rechargeable battery for up to 8 hours. You can also power the Professional Connected directly from the cigarette lighter socket. For areas of low GPRS coverage, a PC may also be used to update the Road Angel Professional Connected. PC running Microsoft Windows Vista, XP or 2000, Internet Explorer 6 or higher, 256Mb RAM, 20Mb Hard Disc space. An Internet connection is required for software updates, subscription services and more. PC update through USB does not currently support the Apple Macintosh operating system - however all Connected Road Angel devices receive speed camera and blackspot information using a built in sim card - no computer is required. Want to add accessories to your Road Angel Professional Connected? We sell a very limited selection of genuine Road Angel parts and accessories here.